The zoo is inviting the public to suggest names for the cubs. DUBLIN ZOO SAYS that two endangered Amur tiger cubs born in October last year are ready for visitors this weekend. The cubs, both female, have grown from 1.5kg to 15kg in that time, and will be on view this weekend at the zoo’s tiger habitat. Speaking in December, the zoo’s director said the cubs hadn’t been placed on view yet as they were still weaning. “The cubs are doing extremely well, Tundra is an exceptional first-time mother and she has shown strong maternal instincts from the very beginning,” the zoo’s Ciarán McMahon said. The cubs are “playful and energetic”, said McMahon, and they “have fun chasing each other and play-fighting which helps keep their claws sharp”. This weekend, from 11am to 3pm, the zoo will host “tiger-themed activities” each day. The activities will be free after entry to the zoo. The cubs will be on view from 11.15am to 3pm both days. Amur tigers are an endangered species, with only about 500 individuals believed to be living in the wild. October was the first time in over 20 years that the zoo had seen the birth of Amur tigers. “Dublin Zoo hopes that the two young females will later become part of an international breeding programme for the species and contribute to the low population numbers,” said today’s statement. Once known as Siberian tigers, their name was changed to reflect the wider area the tigers used to inhabit. Now, they’re only found in the Amur Valley in Russia. Dublin Zoo is holding a competition to name the cubs, inviting the public to make suggestions “based on their Russian origins”. Amur tigers are the largest and heaviest of all cats, and have the thickest fur. Their only predators are humans, and though they’re protected, they are still killed for their fur and body parts, used in some traditional medicines and ornaments. Naming suggestions can be submitted on the Dublin Zoo website, and the winners will receive a family day pass to visit Dublin Zoo on a date of their choice. 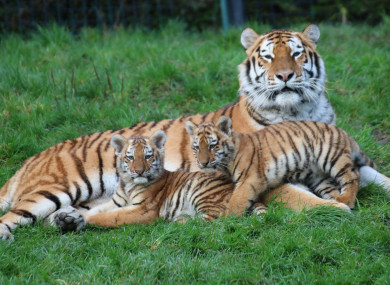 Email “First Amur tiger cubs born at Dublin Zoo in 20 years to go on view this weekend ”. Feedback on “First Amur tiger cubs born at Dublin Zoo in 20 years to go on view this weekend ”.